Peppermint is a traditional winter flavoring for many different goodies. Add a little chocolate, and you have a real treat to celebrate any fun event. For a Gluten-free Goodie of the Week recipe, especially during the winter months, you can’t go wrong with peppermint meringues with chocolate drizzle. They’re colorful and festive and a cinch to make. Some people have a fear of making these treats, but they couldn’t be any easier. 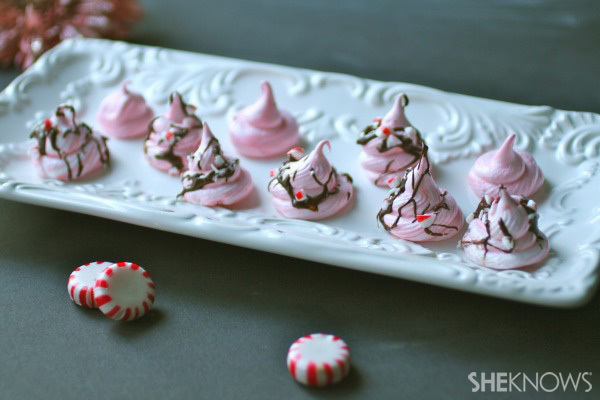 The fun part about mixing up a batch of peppermint meringues with chocolate drizzle is that they are perfect for so many winter celebrations, and their pink tint makes them great for Valentine’s Day, too. Keep this recipe close at hand. I guarantee you’ll enjoy making it all winter long. Preheat oven to 225 degrees F. Line 2 baking sheets with parchment paper and set them aside. In a metal bowl, add the egg whites, salt, and cream of tartar. Use a mixer to beat the ingredients until soft peaks form. Add the peppermint extract and continue to beat. Add the sugar, a little at a time, while continuing to beat the mixture. When stiff peaks start to form, you can stop beating. This should only take a few minutes. Add the red food coloring to the meringue mixture, but don’t stir it. The colors will swirl as you pipe the mixture onto the baking sheets. Transfer the mixture to a pastry bag fitted with a star-shaped tip (or sealable plastic bag with the tip of one corner cut off). Pipe the meringue into 1-2-inch swirls onto the parchment-lined baking sheets. Place them about an inch or so apart. Place the baking sheets in the oven, then turn the oven off and let the meringues remain in the oven for about 2 hours (do not open the door to the oven) to dry. When they’re done, the outsides will be crispy and the insides airy and more crumbly. If you need to, keep them in the oven for 30 minutes or more. When the meringues have dried completely, remove them from the oven. Add the peppermint candies to a sealable bag. Close the bag and use something hard to crush the candy into tiny pieces. Melt the chocolate chips in the microwave, working in 15-20 second increments. Once melted, use a spoon to drizzle the chocolate over the meringues and immediately sprinkle with the peppermint candy pieces. Enjoy these treats all winter long!